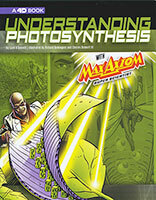 Join Max Axiom as he examines the life-sustaining process of photosynthesis and the relationship between plants and energy on Earth. Young readers will dig into the mysteries of one of nature's coolest secrets! Download the free Capstone 4D app for an augmented reality experience that goes beyond the printed page. Videos, writing prompts, discussion questions, and hands-on activities make this updated edition come alive and keep your collection current.